Markets are taking a breath this morning succeeding four consecutive days of gains, with the energy complex seeing losses across the board. Crude prices are down .77 cent (1.48%) this morning after prices closed 10 cents higher during yesterday’s trading session. Prices saw an intraday high of $52.33 before closing at $52.04. The market is focused on U.S. 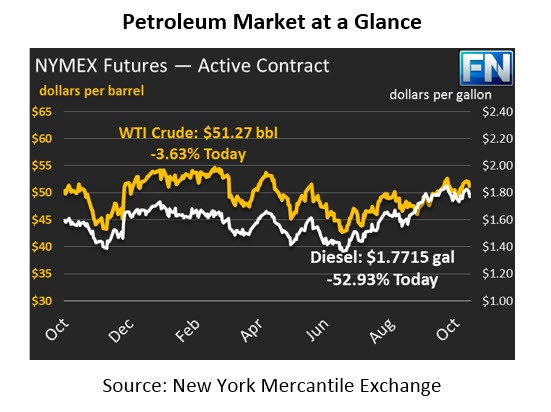 Inventory data, OPEC rhetoric, and Middle Eastern conflict. Diesel prices experienced substantial losses today after a bearish EIA report for refined products. Gasoline also weakened, though not as drastically as diesel, losing 1.40 cents (.85%) compared to diesel, which lost over 3 cents (1.74 %) since yesterday’s close. Diesel and gasoline prices are currently $1.7715 and 1.6289 respectively. On International news, OPEC is sending strong signals that the deal could possibly be extended through the end of 2018, nine months past the original extension set to expire in March of 2018. Russian President Vladimir Putin said in Moscow earlier this month that if OPEC and its allies decide that further supply cuts are needed, it should be done until the end of next year. Since Putin’s statement, representatives from Iran, Angola, and Algeria have indicated that they would also be willing to further extend the deal, Bloomberg reported. Crude oil shipments from Iraq to Turkey plummeted after oil fields changed from Kurdish to Iraqi government control earlier this week. Pipeline exports fell to one-third of their usual volumes, shipping sources disclosed to Platts. The market will continue to watch as the conflict initiated concern that output from the northern fields could potentially remain stuck without the Kurds cooperation to ship product though the Iraq-Turkey pipeline. The EIA released its weekly inventory report yesterday. At first glance, the report appears to be rather bullish in regard to crude oil; however, many inventory experts said that the crude draw was skewed by the effects of Hurricane Nate as production was paralyzed in the U.S. Gulf of Mexico. Crude inventories fell by 5.7MMbbls, and though this number may be exaggerated due to natural disaster decreasing U.S. output by an average of 1.074 million barrels per day, shale production and seasonal demand appear to be impacting the market nonetheless. Crude drew for the fourth consecutive week pushing inventories well below year-ago levels, yet they still remain 17% higher than the 5-year average.